Low Voltage (LV) Switchgear Market Size in 2018 exceeded an annual installation of 30 million units and is anticipated to exceed USD 80 billion by 2025. 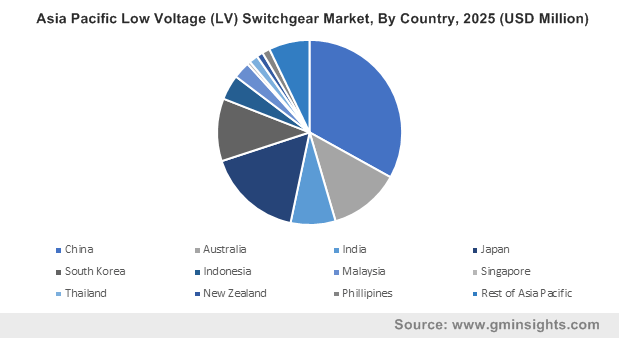 The LV switchgear market is anticipated to witness an upsurge on account of increasing expenditure towards infrastructural expansion. Growing rural energy demand along with ongoing amendments integrating security of supply will drive the industry growth. Moreover, the reinstallation of electric distribution infrastructure in war affected countries across the Middle East will boost the overall product penetration. Regulators across Japan, in 2017 declared to invest over USD 16 million in accordance with the UNDP reforms across Iraq, with an aim to stabilize and renovate the infrastructural establishments across the region. Circuit breaker integrated LV switchgear market is anticipated to grow over 6% by 2025. Ability to reset in line with operational safety pose immense growth potential across networks having frequent current outages and faults. Furthermore, these units owing to their wide applicability across utility based and industrial installations will further augment the business scenario. Low unit cost and quick reaction time in comparison to its competitive counterparts support the installation of fuses across the low voltage switchgear market. In addition, substantial incorporation across the circuits inducing sensitive electronic devices coupled with rising demand for smart control systems will further enhance the product demand. Fixed mounted units in 2018, held over 40% of the overall low voltage switchgear market share. The adoption of limited adjoining parts along with low failure rates have substantially swayed the product installation across the industry landscape. Easy installation along with effective mechanical stability will upscale the plug-in low voltage switchgear market. Rapid integration of portable multifunctional modules across offshore windfarms, railway applications and digital substations will further fuel the product penetration. The ≤ 1000 Ampere LV switchgear market is predicted to surpass USD 18 billion by 2025. The products owing to wide applicability across process industries, power and infrastructure sectors along with decentralized networks will witness appreciable growth across the forecast timeline. The 1001 to 5000 Ampere LV switchgear market in the recent years have gained impetus on account of their wide commercial & small-scale industrial applications. Rising demand for manufactured goods coupled with versatile product operations across the primary and secondary distribution networks will further augment the industry growth. 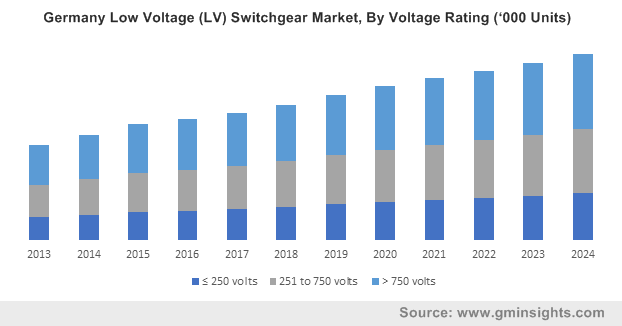 ≤ 250 Volt LV switchgear market will observe growth of over 7% in alignment with consumer inclination towards the integration of smart LV control units across residential peripherals. Basic power alteration feature along with versatile product applicability across blowers, fans, elevators, motors and pumps will further nurture the product demand. > 750 Volt LV switchgear market is predicted to grow on account of their large-scale applicability across semiconductor, heavy assembly, automotive, pharmaceutical and biotech industries. In addition, ongoing adoption of LV units across airports correctional facilities, water treatment plants, co-generation plants and critical power applications will further boost the business growth. Indoor low voltage switchgear market is projected to grow owing to upsurge in the real estate sector across emerging countries. Substantial growth in infrastructural investments from government along with private funding institutions have paved the foundation for a competitive business scenario. Outdoor low voltage switchgear market size is predicted to witness growth on account of ongoing expansion of utility aided power distribution infrastructure. Large scale integration of distributed power generation technologies along with rampant industrial growth will further amplify the business potential. Lesser heat generation, economical losses, flexible and effective high-end voltage levels have been few indispensable parameters driving the AC low voltage switchgear market. Effective conducting properties & economical operations along with ease of current modulation will further boost the industry outlook. Growing demand for quick fault clearance facility favoured by enhancing product efficiencies will boost the demand for DC low voltage switchgear market. The availability of operational support for AC circuits interconnection favoured by lower operational losses will further stimulate the product adoption. Manufacturing and process industries in the current regime are pivotal across certain economies for investments and revenue realization. 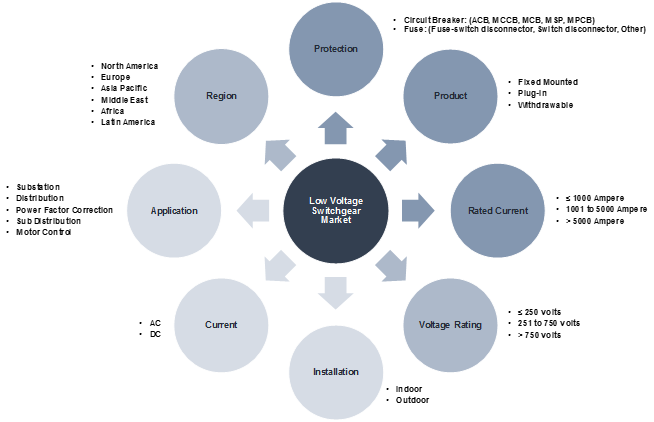 Developed economies pose dependency on manufactured & processed products driving utility & installer preferences toward the integration of effective distribution which in turn will augment the low voltage (LV) switchgear market share. Utility aided distribution grid networks have ever since been influenced by regulatory and government directives in reference to the establishment of electric infrastructural. Favourable government regulations toward rural electrification and the integration of decentralized micro-grid networks across grid isolated areas will complement the low voltage switchgear market outlook. The U.S. LV switchgear market is predicted to grow over 5% by 2025. Government initiatives toward the replacement and upgradation of existing distribution networks coupled with growing demand for cost competitive products will boost the industry potential. Regulators across the U.S., in 2017 declared a fund allocation worth USD 647 million in accordance with their Electrification Project across the Peninsula Corridor. The low voltage switchgear market across UK will witness growth on account of positive regulatory reforms toward sustainable energy integration. Moreover, ongoing deployment of decentralised power systems in line with smart low voltage control units will further complement the business growth. Eminent market participants include GE, Schneider, Siemens, E+I Engineering, Hyosung, ABB, Eaton, Mitsubishi, Hyundai Electric, Powell, Hitachi, Hubbell, Fuji Electric, L&T, Skema, Norelco, START, AL Hassan Engineering and Lucy Electric. Low voltage switchgear carries, makes and breaks the normal load current & further clears the fault through regulation and metering of favouring parameters across the power system.